For the LOVE of BEER! 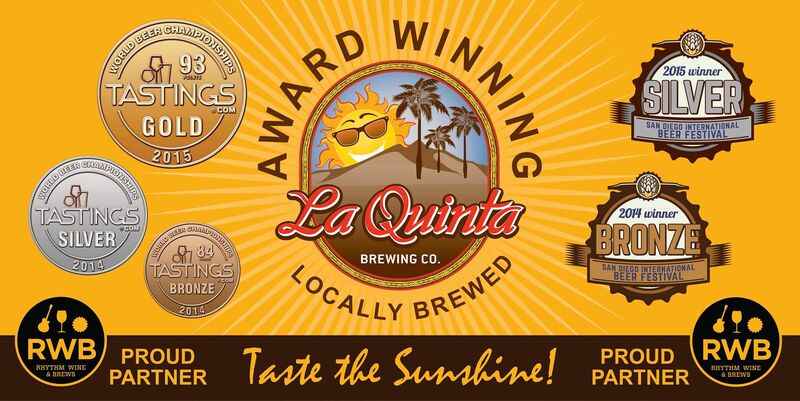 - La Quinta Brewing Co.
There’s no better way to celebrate the month of love then to share your love of local craft beer with your favorite people! Our Old Town La Quinta Taproom is open and in full swing bringing a stellar lineup of craft beer, wine & ciders. Selections are constantly rotating to meet all your pallet needs! Both, our Old Town taproom and brewery/tasting room are open 7 days a week for your enjoyment. Event season is in full swing here in the desert and our calendar is loaded with special events such as live music and Trivia Nights at the brewery and LIVE MUSIC every Thursday night at our Old Town Taproom. Also, we are proud to partner with the Rhythm, Wine & Brews Festival on Saturday, March 5th, in Indio – plan to join us for this fun event! Follow us on Facebook for updates on all our upcoming events and happenings at the brewery and Old Town Taproom. Cheers!